The first Esper Dream came at the beginning of the rush of Famicom RPGs, while its sequel, released five years later in 1992, was one of the last. 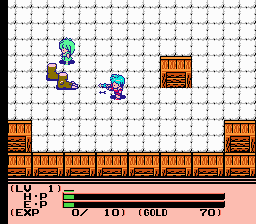 Esper Dream 2 takes practically every single aspect of its predecessor, refines them, and fixes most of its problems, resulting in an outstanding title that could easily compete with early 16-bit titles of the day. 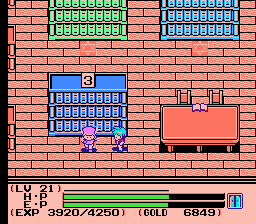 The general concept is largely the same, though framed in a more logical manner – you play as a young boy (you can name him, but his canon name is “Mamoru”) in the “real” world who can teleport to various themed fantasy worlds via bookshelves at his local library. Each one of them is in some sort of trouble, and it’s up to you, the mysterious outsider with ESP powers, to save them. There are four worlds in total. One of them takes place in a quiet seaside town, where their light-giving orb is stolen by a mysterious entity. 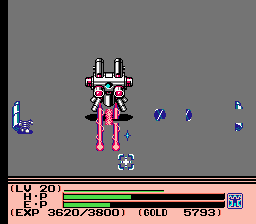 Another is a Galaxy Express 999-style train which flies through outer space and is being terrorized by a giant bunny rabbit. 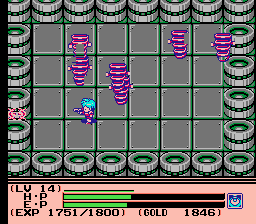 There’s a magnet factory, which is entirely inhabited by living nuts and bolts, and a glowing mountain which is being terrorized by Fuujin and Raijin, the Japanese gods of wind and lightning. 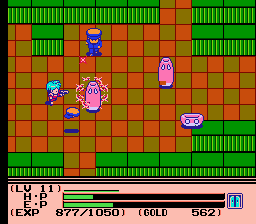 These scenarios are more self-contained and far more fleshed out than the “explore dungeons, find junk” structure of the original game. 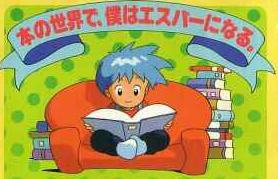 Though there are four worlds in total, there are actually five bookcases in the library – the third is meant to be the world of the first Esper Dream. 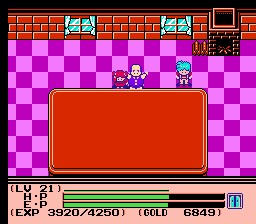 However, the hero of that game simply appears and gives you the item you need – apparently he’s already done the hard work for you. 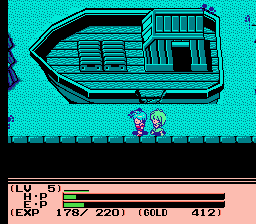 It’s a neat little reference, although one can’t help but think that it was originally meant to be a full world that ended up getting cut. 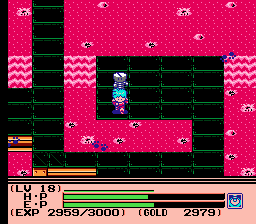 Beyond the more involved storytelling and structure, Esper Dream 2 simply plays much, much better. 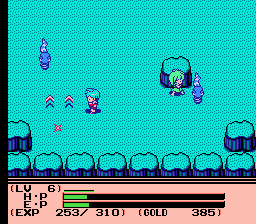 Encounters work mostly the same as before, although the battlefields actually change randomly, so you’re no longer simply fighting on the same terrain over and over. 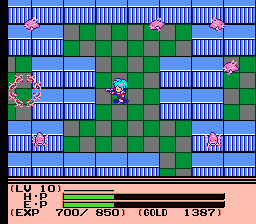 Most battles are no longer boxed in either, so escaping is as simple as sauntering off the screen. 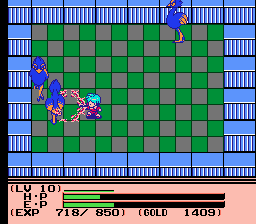 Even the more difficult fights where the arena is encased can be escaped from with a teleport spell, which will similarly transport you back to the world’s home base town when used outside of battle. 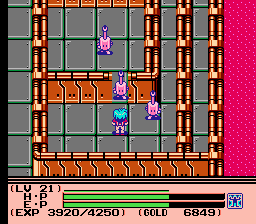 You can now move in any direction, although you can still only fire in the four cardinal directions. The item drop rate is much more generous, giving you more gold and even the occasional health restorative. You can now carry healing items with you as well. 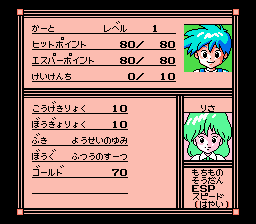 Quite possibly the best addition is the speed option, enabled in the menu, which drastically kicks up the pace of the game, making both battles and exploration much faster. 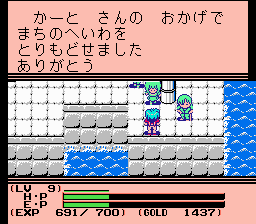 Although you start out each world by yourself, each world has a unique helper, who will accompany you in battle. 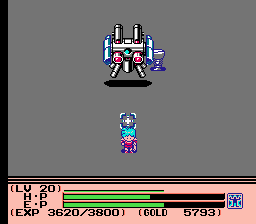 They’re totally invincible and are controlled by the computer, and while the AI isn’t terribly brilliant, they will regularly use special attacks that affect every enemy on the field. 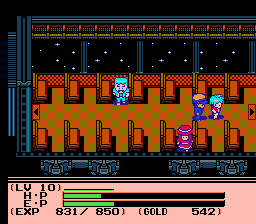 The water town gives you the green haired Lisa, who can sing enemies to sleep, while the train area gives you the elderly conductor Aram, who can similarly stun foes with his whistle. 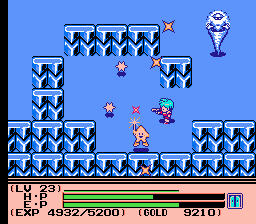 The magnet factory gives you Neji-kun (“Screwy”, as known in the fan translation), an anthropomorphic screw who can hurl himself across the screen, and the glowing mountain gives you Hoshi-kun (“Starry”), a walking, talking star who can cause sparkles to rain from the skies. You can even talk with your cohorts outside of battle to figure out your next goal. These partners, along with all of the other improvements and balance changes, make it far more playable than the original game. 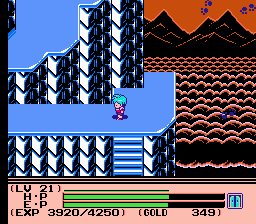 In general, of course, it also means it’s substantially easier, though the boss battles and final areas remain fairly challenging even after you’ve leveled up a bit. 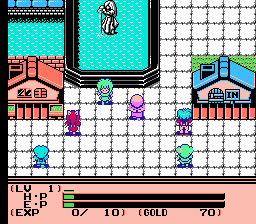 Esper Dream 2 is a fantastic looking game too. 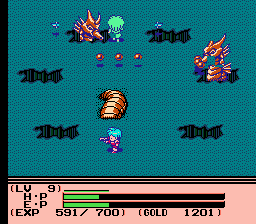 Along with Akumajou Densetsu and Madara, it’s one of the three Famicom games that uses Konami’s VRC6 chip, which not only allows for improved graphical effects but also greatly enhanced music. 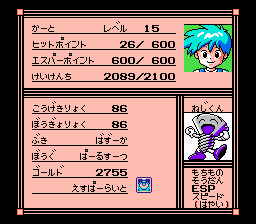 The soundtrack is greatly expanded over its predecessor and quite catchy, though the single battle theme does grow repetitive over time. 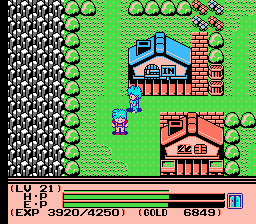 The character sprites are bright and distinctive, the backgrounds are well animated, and the world feels much more alive than the typical Famicom RPG. 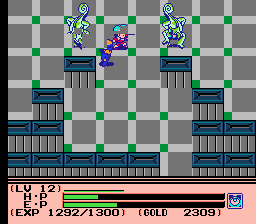 The enemies are still occasionally weird and random, like the disembodied stomping feet or the leaping flea things, but most areas have several unique enemies which fit more closely to the theme of the world. 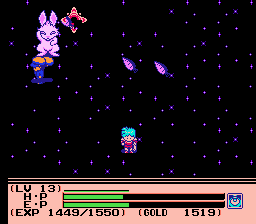 The gulf in quality between Esper Dream and Esper Dream 2 is stunning. 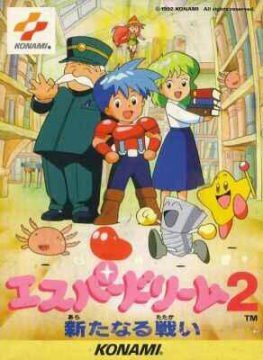 The first is an early game with lots of great ideas but iffy execution; the sequel manages to keep the core concepts, while improving the action and removing most of the tedium, to make a game that’s one of the best RPGs on the Famicom and remains remarkably playable even today. 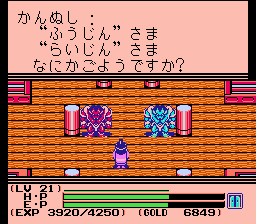 It’s also available in English thanks to a fan translation by Aeon Genesis.